It’s hard being a Phoenix Wright fan sometimes. The games tell some great stories, and have lots of fun, lateral thinking puzzles, but you have to wait years between releases. Even then, Capcom always seems to jerk you around over whether or not the next game in the series will even be localized (my heart still aches for Ace Attorney Investigations 2). But you put up with it– the long waits, the uncertain future plans and, yes, even the digital-only release– all for the love of the franchise. So, here we are again with a new title in the series– this time, the first entry on the 3DS. Do the fancy graphics and new characters live up to the franchise’s legacy? Let’s pin on our attorney badges, brush up on our Chords of Steel, stretch those pointing fingers, and find out! 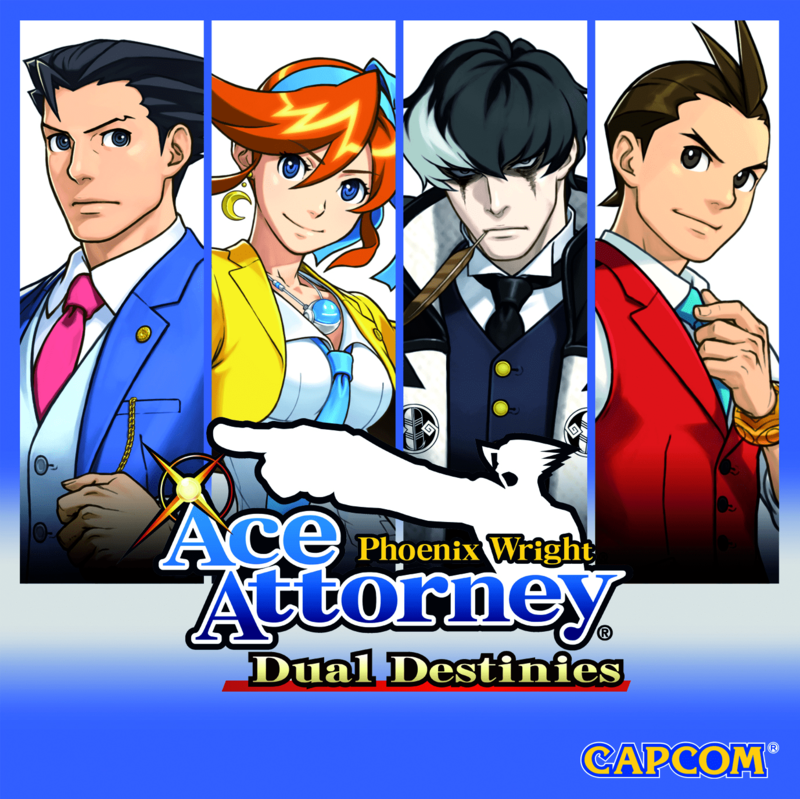 Phoenix Wright: Ace Attorney – Dual Destinies picks up a year after the events of Apollo Justice: Ace Attorney, with Phoenix returning to the courtroom after a long absence. Joined by his protégé(? ), Apollo, and fresh-faced newbie lawyer, Athena Cykes, the team from the Wright Anything Agency will take on several cases to defend their innocent clients, combat a threatening new prosecutor and uncover a years-long conspiracy that has rocked the foundations of the legal system. From a gameplay standpoint, very little has changed in this iteration of the series. The story of each case moves along in two distinct modes: court and investigation. The investigation portions have players look around crime scenes for evidence, and interview persons of interest about the crime to try to find out the real nature of each case. The story then moves to the court portion. Here, players will be presented with the prosecution’s theory on how the crimes took place, and will need to refute these claims to exonerate their client. This is done by pressing witnesses for more information, and presenting evidence that doesn’t line up with what is being said. Can you spot the unusual emotion? At least, this is how things are usually done, but, when witnesses are being particularly difficult, sometimes more… unconventional measures need to be taken. Each lawyer has a special ability that can be used at certain times to coax more information out of witnesses. 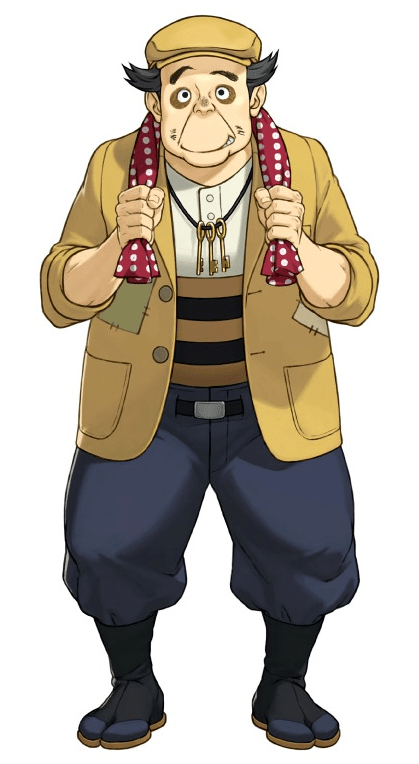 Phoenix can use his mystical magatama to see “Psyche-Locks” on people’s hearts, allowing him to know when someone is guarding some kind of secret. Apollo returns with his special bracelet, which gives him the ability to spot physical ticks or tells in witnesses when they are trying to hide something. The most used feature, though, is Athena’s Mood Matrix, which has players analyze a witness’s testimony against their emotions while delivering said testimony. They will then need to point out emotions (or the lack thereof) that don’t line up with how a witness ought to be feeling when recalling certain events. It’s always great to find different angles to look at a case, and the Mood Matrix does an excellent job of that. Phineas Filch is the highlight of the game’s second case. One of the biggest differences that players will notice when starting up the game is the overhauled graphics. 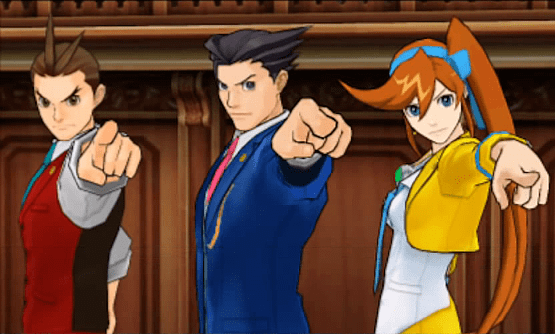 The art of the Ace Attorney series has steadily improved since its inception– from the Game Boy Advance graphics of the original three Phoenix Wright games to the sharper imagery of Apollo Justice and the Investigations games on DS. Dual Destinies is the first time that the franchise has used 3D models for their characters, as well as some of the environments. At first, I was worried that something would be lost in the translation from 2D to 3D, but after seeing the game in action, those fears have dissipated. The only time I really had any problem with the game’s use of the system’s stereoscopic 3D was when examining crime scenes, as focusing on both the crime scene and your cursor is next to impossible. It’s simple enough to fix by just turning the slider down, though. Characters are more animated than ever, with movements that were simply not possible on the older systems. After the mostly static animations, the movements from the 3D models are amazing by comparison. Even stationary animations like looking around, sighing and crying are incredibly smooth, and bring the characters to life like never before, while still staying true to the original anime art style. 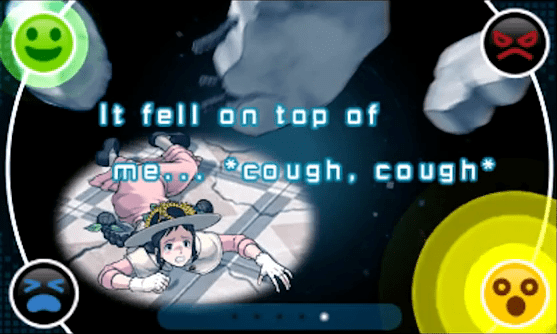 Dual Destinies utilizes the system’s 3D feature in some interesting ways. At least, this is the case most of the time. Unfortunately, the most important characters seem to have been neglected in the translation to 3D. While Athena looks great, and her animations are easily on par with most of the game’s other characters, the same cannot be said for Phoenix and Apollo, or most of the other returning characters. While the developers obviously remade their animations from the original sprite art, doing so seems to have made them more… robotic. While the supporting cast of the game springs to life with these 3D models, restricting the animations of Phoenix and Apollo seems to have done more to limit them, making them stand out in an unflattering way. I was particularly disturbed by the way returning character Trucy looked. While her original art in Apollo Justice was cute and lively, she looks almost lifeless now. Maybe it wouldn’t be as bad if I didn’t have anything to compare it to, but, when seeing her 3D model in comparison to her original sprite, something seems to have been lost. It isn’t as big a deal with Phoenix and Apollo, whom we hardly ever see anyway due to their first-person perspective, or being limited to their actions behind the bench, but I feel more is expected of the supporting cast. Being seen much more than our lawyers, it’s often their job to keep things lively. In this respect, I feel Trucy fell short, as her rigid animations and strangely lifeless eyes pulled me out of the experience more often than not. I’m just glad that these encounters are fairly few; the rest of the supporting cast easily picks up the slack of these few shortfalls. 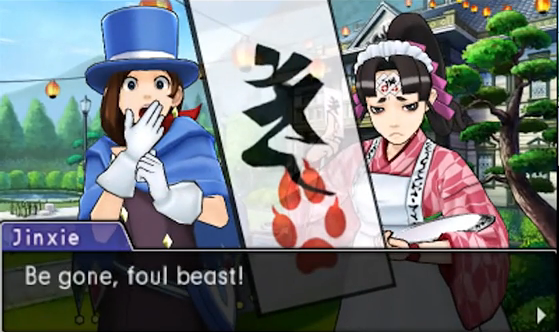 What did you do to Trucy?! Graphics are nice and all, but they’re nothing without a good plot, and that’s always been one of the most important selling points in the Ace Attorney series. 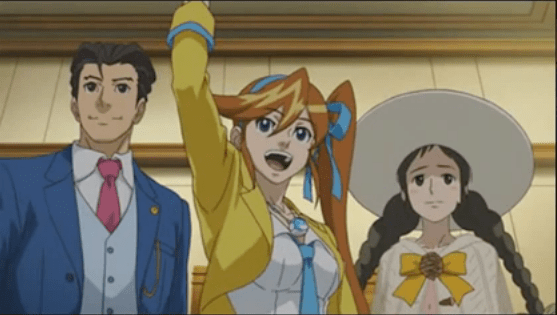 As per the norm, Dual Destinies features a string of episodic cases in which Phoenix, Apollo or Athena (depending on the case) must work to defend their client who has been falsely accused of murder, while trying to reveal the true culprit. Throughout the game, there is also an overarching storyline in which Phoenix and Co. must work to fight the “Dark Age of the Law,” where getting the desired verdict is valued more than finding the truth, and false accusations and fabricated evidence are becoming commonplace. Dual Destinies has also done a good job of allowing players to get to know their clients better, making caring about their plight much easier. Talking to them more often, and learning more about their circumstances and what drove them into the position they now find themselves really makes you want to see each client walk free. And when it does happen, it’s all the sweeter to see things are finally resolved, and you finally get a smile from a client’s daughter who has spent the entire case endlessly fretting. On top of this, Dual Destinies also features several anime cutscenes that play throughout the game. For the first time, we’re given a fair bit more voice acting than just the standard interjections we’re used to from the series. It’s a nice way to include a bit more story than what the games could do previously.